You can opt to receive newsletters, email notifications, and more via email. From your dashboard, click on "Account." You will be taken to the account preferences page. From there, click on "Notification Settings" on the right hand side. You can choose to receive newsletters by selecting "Yes" or opt out by selecting "No"
1. Receive email for actions made by you. You will receive a notification after you have cancelled or rescheduled a lesson. 2. 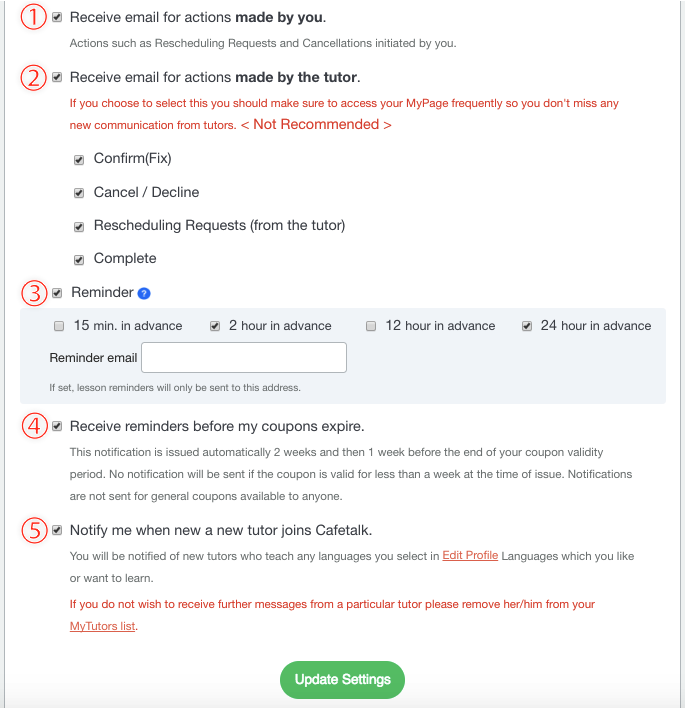 Receive email for actions made by the tutor. 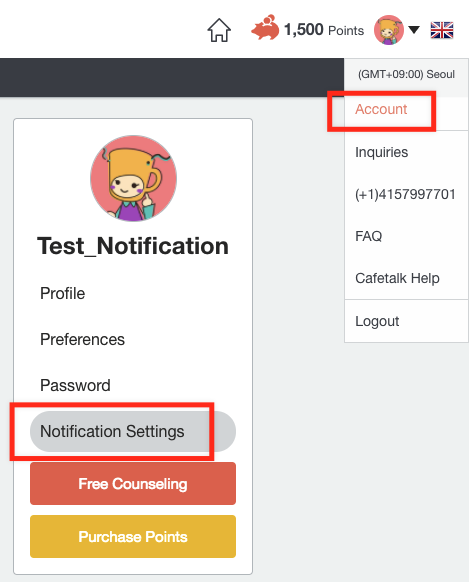 You will receive a notification if your tutor decides to Confirm (Fix), Cancel/Decline, Reschedule, or Complete a lesson. You can choose to receive your lesson reminders 15 min, 2 hours, 12 hours, or 24 hours in advance. 4. Receive reminders before my coupons expire. This notification is issued automatically 2 weeks and then 1 week before the end of your coupon validity period. No notification will be sent if the coupon is valid for less than a week at the time of issue. Notifications are not sent for general coupons available to anyone. 5. Notify me when new a new tutor joins Cafetalk. Click Update Settings to update your settings.